When setting the filter and joining the lid and the main body It is difficult for the filter to slip out of the lid. If the shaft guide on the lid side is a little longer, can it be set easily? This review is about item#39243154. I am satisfied with the housing, but it seems to be easier when disassembling if there is a drain at the bottom. This review is about item#45501023. It is in use especially without problems. Until now we have used things of a famous company, but this product seems to be stronger. Filter the tap water stored in the tank before using it. It is awesome as Cospa. Unfortunately, there is water leak from the air release button on the top. I have purchased two sets this time, but one is okay. There seems to be some bad products as a product. I expect it for after-sales follow-up. We made a pure water device by combining various filters inside, but this was the best one with air holes and cheap ones. This review is about item#45501005. Uses to filter sand of well water. I gave it to my house using well water where sand often appears. The thread winding filter will be set inside. There was such a product. I was pleased. It is used for filtration of household well water. It is used side by side in parallel with household well water filtration. In the past 6 purchases, 2 in 2 were about half a year and cracked and damaged in the upper threaded part for cartridge replacement. (Tightening is hand-tightened because packing is included.) Will the thickness of the threaded portion be thin? Considering it as a consumable item, I have a spare. The product was solid and satisfactory without problems, but the packaging of the product was subtle. The product is contained in a vinyl bag, around which an air cap (bubble wrap) is wrapped and packed together with paper cushioning material and arrived. The problem is that the bubble wrap has 10 to 20 small black spots and I did not mind thinking it as garbage, but when I look closely it moves ... It is a small insect (about 1 mm) surprised. Probably, I think that it is an insect that is flying around the height of the face and hanging out. Was it brought in by static electricity of bubble wrap at the time of packing? There is no actual damage, but it feels a bit disappointing. This review is about item#39243172. Used for the purpose of taking mud in the water. The amount of water used is 4 L / min, but I bought a 0.5 micron filter to take mud firmly at a slow flow rate. Making is solid. A regular filter element was fitted and used as a water filter. When attaching the element, the top of the element and the top of the unit are at the same height. It is very difficult to install the element and this machine at the same time. It would be impossible for an amateur. As I understood that it was a difficult time to exchange elements, I made a pipe that protruded about 30 mm from the bottom of the hole at the center of the upper bracket and inserted it. We solved this by installing elements using this as a guide. I would like to improve it because it costs a little. This review is about item#39243197. I am very satisfied with the durability and usability are good for the price. I handle the well by myself (without electric power tool) at home and I use it for filtration of well water. 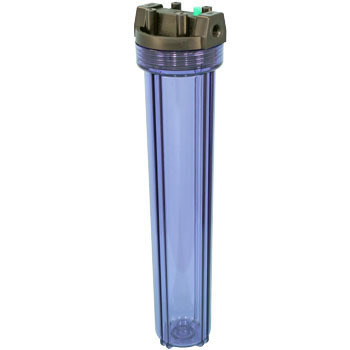 When setting the filter in this 20-inch housing, we set the filter in the transparent tube and screw it in. However, this is very difficult, the 20-inch filter head runs right and left to set it in the desired place and it suffers hard. It is doubt whether it is actually set. So we wrapped 20 A 5 cm of vinyl chloride with 3 cm protrusion of 20 A on the exit side of the fixed part (male screwed in) and inserted the head hole of the filter in the 20 A PVC pipe first and set it. It can be set perfectly. What is the reason for leaks in the filter? Please improve. This review is about item#39243163. The housing that arrived was broken. There was no cushioning material in the packaging. I got the procedure of product exchange soon, but the schedule shifted. I think that it is managed in the warehouse, but I think that the check should be strengthened before shipping. I thought that the product was cheap and easy to use. It is repeat purchase. Well water purification (Turbidity removal by fine grain mud) Two stages of filters were connected. The transparent housing makes it easy to see the dirty filter and the timing of replacement. It is a housing that is solid and easy to use. I thought that bleeding is unnecessary, but it is convenient to reduce stress on piping. This review is about item#45501014.